Are you familiar with making paper mache by using balloons? If you have done this before, then making some rocks using old paper or trash is a similar process. Trash rocks will provide an inexpensive way to add interest to any landscape. The difference between paper mache and trash rocks is you are using cement. This means the rocks are likely to be heavy to move. One thing about this project is you do not need to use trash bags. A wire mesh is used to create the trash bag. This is important as the wire will help the cement adhere when making your rocks. 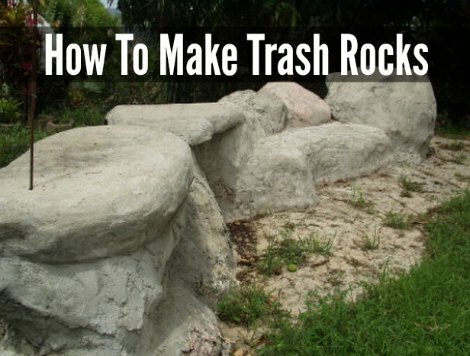 You can fill trash rocks with any material that can be recycled. This will include wood, stone, or paper that would otherwise be thrown out. The best thing about this project is you can use these rocks on any landscape for basic function or as decorative elements.